There are some excellent Standard Bank credit cards for people with good credit records to choose from. And those with a bad credit core needn’t give up hope. There are excellent credit cards for people with a poor credit score. These are people who have always thought this door of opportunity was closed to them. Each credit card comes with its own unique advantages that will appeal to many different kinds of cardholders. The Standard Bank of South Africa provides these credit cards – Gold, Titanium and Platinum – and as one of South Africa’s largest financial services groups, you can trust them to come up with cards that appeal to many different South Africans. These credit cards from Standard Bank offer wonderful convenience as you can use the card safely in South Africa, abroad or online. Standard Bank tells its customers that wherever you’re going and whatever you do, there’s a credit card to suit. 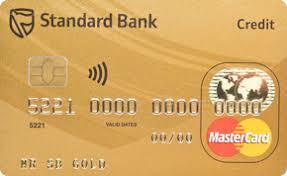 If there is any information you need regarding your Standard Bank Credit Card, all card information about using the cards, its safety and te rms and conditions are available on the Standard Bank website. With a MasterCard credit card you can in fact shop online, make use of a budget facility for purchases of R200 or more, make purchases wherever you see the Mastercard sign, and shop in complete safety, thanks to the secure chip and PIN features of the card. You can also withdraw cash at any Standard Bank branch or ATM where you see that the MasterCard sign. The Standard Bank Gold Credit Card for instance, comes with low interest rates and there are no transaction fees when you swipe to purchase. The card comes with many free features and it’s a credit card that can be yours if you earn R5 000 or more each month. The card comes with a R50 monthly fee. You’ll need to be 18 and older to own this card and approval of it requires credit checks. With this Gold Credit Card you also get up to 55 days’ interest-free credit. This is for when you pay the outstanding balance on time and in full each month. You can manage your payments easily with their mobile app. An Achiever credit card allows you to shop without cash and also gives you access to extra funds for that must-have item. Why not apply on-line for your Standard Bank credit card? You can use it all over the world and instead of carrying cash, you carry one plastic card. The credit card gives you two kinds of additional cash – your revolving facility for everyday purchases and your budget facility for bigger purchases.